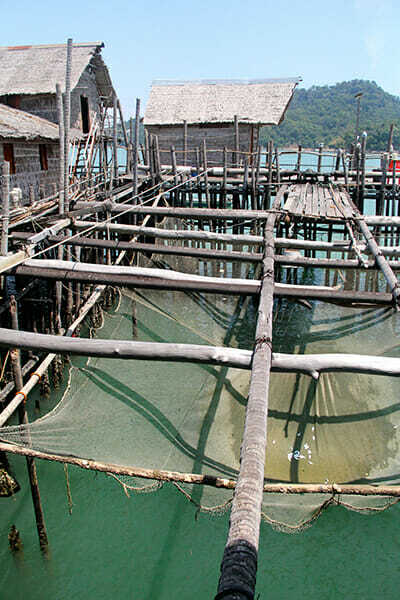 These wooden structures built out into the sea have nearly vanished from Southeast Asia. Way back in the 1300s, Singapore was not Singapore but Temasek, or “sea town” in Malay. Up until the arrival of the British in 1819, it remained a sleepy fishing village, its people sieving the sea for sustenance. Singapore industrialized and grew rapidly; today, it is highly developed and modern. Yet in isolated pockets, the aforementioned ramshackle water buildings — and the lifestyles of their residents — persist to this day. 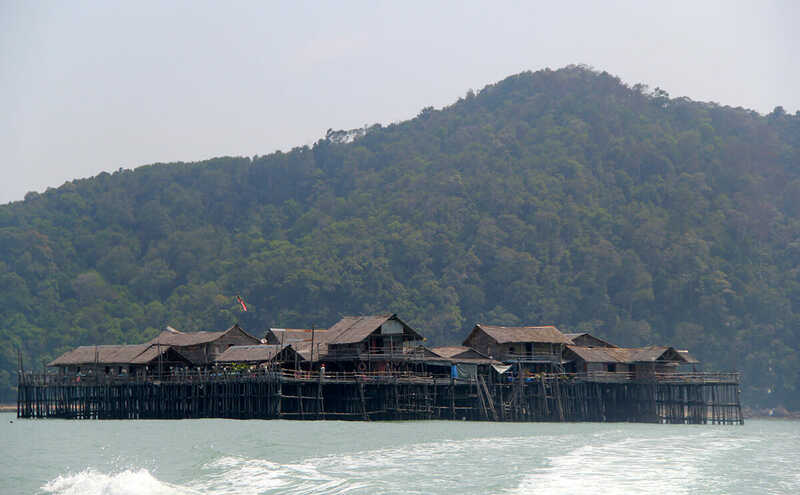 These are the kelongs of Southeast Asia: wooden stilted structures built out in the sea over shallow water and found mainly in Indonesia, Malaysia and Singapore. They are made by driving 20-meter poles — traditionally from the nibong palm tree — six meters deep into the seabed then securing them with rattan rope. Wooden floorboards are rudimentarily tacked on in between the stakes, to make things easier for the fishermen who live and work there. A large, un-boarded square is typically left in the centre of the structure for the net, which is lowered each day to trap the wealth of anchovies, snapper, garoupa, pomfret and the like lurking in the water. However, the future of this centuries-old tradition is shaky. Unfriendly laws, a severely depleted fish supply and the skyrocketing price of natural resources are nudging the industry into certain ruin. “Back in the 1960s, the daily catch of anchovies would weigh up into the tons,” says Farah Au, the amenable owner and operator of Kelong Acheh. Anchored off the coast of Mersing, a small fishing town in southwest Malaysia, the kelong is one of a remaining handful that have clung on to survival by dipping into that most enduring of postmodern industries: tourism. It was converted from a functioning kelong into a resort-at-sea for fishing enthusiasts (nabbing the occasional giant garoupa off its side is excellent for business) back in 1990, when the original owner decided to scarper. 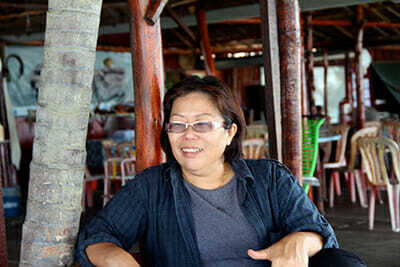 Farah Au, owner and proprietor of Kelong Acheh in Mersing, Malaysia. Recreational fishermen try their luck in the evening, when fish are more likely to bite. 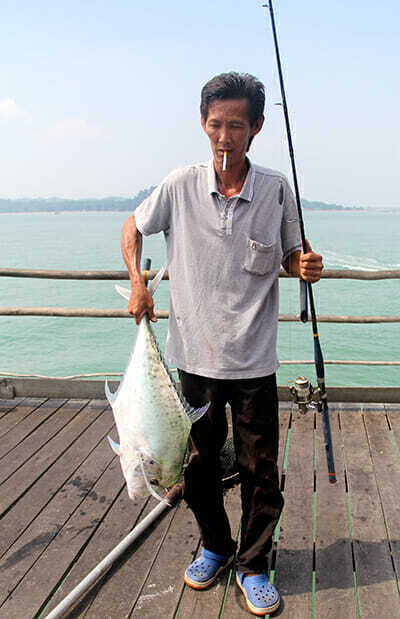 A fisherman poses with the catch of the day - a diamond trevally. Testament to declining fish populations, this was the first major catch of the weekend. Fishing is a relaxing business. Swap the species of fish, calibrate the inherent degree of despair, and her refrain is indistinguishable from the laments from fisherfolk all around the world. In this particular case, the perpetrator is Westport, an industrial port built in Port Klang in 1995. Nine hundred commercial trawler boats were dislocated from the Straits of Klang and deported to the waters around Pulau Acheh, where Au’s kelong is located. They have since drained the waters of its richest, tastiest resources. Now, only two kelongs remain in the area, both of which rely on paying guests. Other challenges abound. “It costs us around RM300,000 ($90,000 U.S.) to maintain the space each year,” says Au. “The nets, flooring, fishing gear, attap roof. The stilts have to be replaced at least once every three years, by specialized contracters.” An average kelong requires 1,000 poles; the cost of driving each into the seabed might cost up to three times the pole itself. What’s more, prices have risen tenfold in recent years due to diminishing supply. In Singapore, there are only six licensed kelongs left, down from a high of 45. This is in stark contrast to the 115 floating fish farms lining the waterscape. That said, the importance of maintaining solid poles cannot be overemphasized. Apart from the inevitability of degradation by water, the stilts need to withstand the pounding waves during the monsoon season. In 2013, Ah Yew Kelong, off the coast of Mersing, collapsed after a thunderstorm destroyed its already damaged foundation. In Singapore, there are now only six licensed kelongs left, down from a high of 45. This is in stark contrast to the 115 floating fish farms lining the waterscape. Unlike kelongs, the farms are built on floating pontoons made of restored oil drums and are relatively easy to build and maintain. Au herself only knows of four other licensed kelongs in her neck of the woods, all of which have been given over to tourism. Managing a a fully functioning kelong like Au’s is no easy task. Creaking floorboards, placed not quite next to each other, offer a glimpse of turquoise beneath your feet. The water supply is dependent on a shipment of brimming jerry cans sent from the mainland. A generator grumbles to life at 6 p.m. every evening and shuts down at daybreak — this means fresh food, too, has to be transported daily. It’s no surprise that commercial fishermen — who try to get by without the crutch of tourism — are giving up. Not one I’ve met is younger than 60. Most speak in dialect. None have plans of passing on the burden to their children. “I have no money to set aside for my retirement. I live one day at a time. I only hope that my three children have enough filial piety to provide for my old age,” says Ng Chow Meng, a Singaporean kelong owner. Under a lattice of sturdy palm poles, the fishing net is lowered every night to trap anchovies as bait fish; 50 years ago the catch would have weighed in the tons. 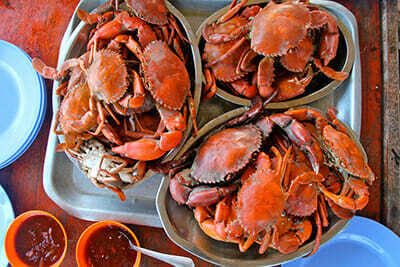 Mud crabs are caught by roving trawlers closer to shore, and transported to the kelong. Freshly steamed, they make for an excellent afternoon snack. Awaiting the arrival of another tourist boat, a young member of staff poses for the camera. Sifting through the evening catch of anchovies. As it is with the death of an industry, one is prone to shroud it in the shimmering folds of nostalgia. True, kelongs are interwoven into the fabric of Malaysia’s and Singapore’s identities. Especially so for the latter, which has been a fishing village four times longer than it has been a maritime port, and whose national mascot is the piscine Merlion (a mythical creature with a fish’s body and a lion’s head). However, as with the e-reader/book conundrum, there are arguments to be made for the new. 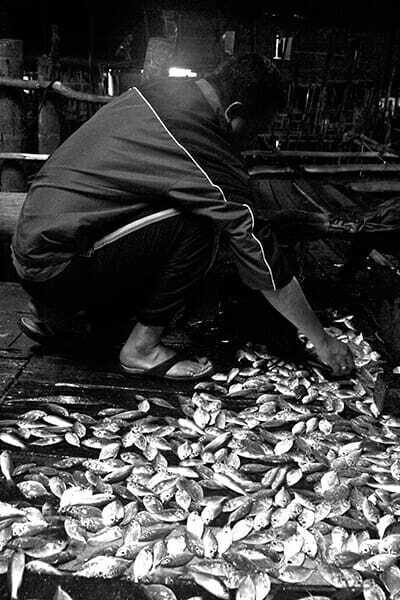 Kelongs do deplete fish stock indiscriminately; they do require an inordinate amount of labor and natural resources. People like Au who have worked out a compromise, keeping the tradition alive while adapting to a new world order. 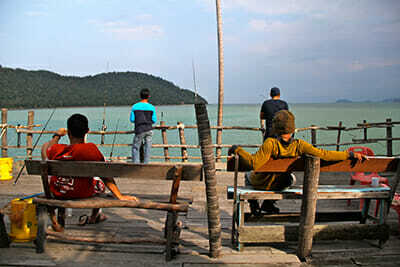 The weekend I spent at Kelong Acheh was one stripped of modern conveniences and distractions. For the first few hours, I wandered around aimlessly, gape-mouthed and garoupa-like. I checked my watch every 15 minutes. Then I started to slow down. I sat and gazed at Pulau Acheh in the distance. I listened to the fishermen make their hyperbolic pronouncements. I ate a snack and read a book and had chats with the other guests. By the time I returned to land, the vibration of my neglected phone left a distinctly unpleasant feeling in my stomach.